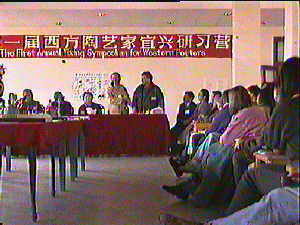 The first "Yixing Symposium For Western Potters"
It happened to me and I was quite eager to go. Of course. China always found itself in the centre of the world. 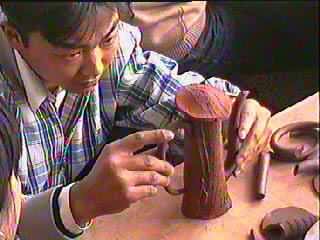 Western potters were invited to work together with local potters in Yixing, China. I'd never made a teapot in my life. Designed, yes. Actually made, no. Since this was a 'teapot-congress', I sat myself behind the computer and played with the CAD/CAM software. 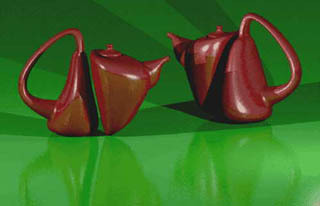 Results were some possible teapots, but mostly impossible ones. Right: one of these computer-renderings. A very select group of 21 Western potters (16 from the USA, 2 Australian, 1 French, 1 German and 1 Dutch) assembled in Shanghai to be transported (as guests of 'Factory No. 5') to Dingshu, Yixing. Yixing is seen as the 'birthplace' of the teapot. The first day was filled with demo's. We were often surprised by the techniques we saw. Some were so simple, that we were surprised that we had never seen them before, or had thought of them ourselves. (This part of China had been closed to Westerners for quite some time). Then we were invited to work ourselves. We were allowed to choose a 'teacher' who would help us to master the special Yixing techniques. 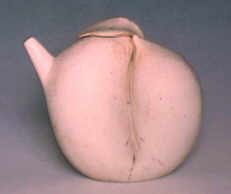 In exchange for that, the Western potters each donated one of their unique teapots, made in their own studios at home. They also worked together with the Chinese Masters to introduce them to the unlimited individualism and imagination that is so characteristic to our art and to the West in general. 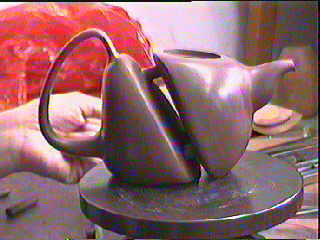 Pic 1st left: A spoke (from a bicycle wheel) is a neat tool to make a teapot-spout. All you need is some skill and patience. Pic 2nd left: endless polishing. 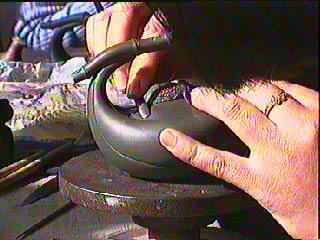 I witnessed 'only' 20 minutes of this action: polishing, refining, polishing, fitting, refining and polishing. No mould to cast in. Only the beating of clay, beating, beating, beating of the clay. Until so dense, so manageable, fit to mount. polishing, measuring, polishing, polishing, measuring and polishing once more, until perfection is reached. to see these 'long-noses' struggle with their clay. rather than perfection and functionalism. Thousands of years of an isolated development and people, trained in these ways from young onwards, were too good an opportunity. The results were a symbioses between two worlds, two ways of looking, interpretations, respect and intelligence from both sides. 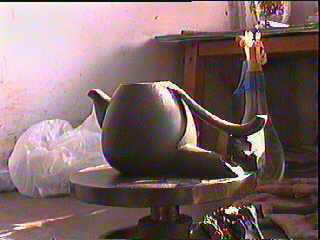 "Swan", as the Chinese named this pot, or "Twist", as I call it, half way under construction. 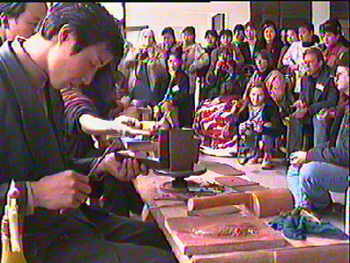 Only simple tools are needed to produce these small artworks: a wooden hammer to beat the clay to sheets, a knife and chopsticks. 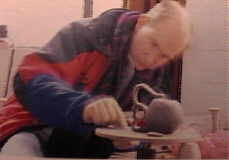 It is astonishing to see how skilled hands can make any idea into a reality. I was fortunate enough to chose Guh Wei Fen. She combines superb technique with a good working brain and lots of imagination. She was able to transform my virtual daydreaming into reality. Virtual pots, never even intended to become actual, are now functional pots. This is how I would sit next to Guh Wei Fen, the master-potter from Yixing. We had no language to communicate, other than drawing, thumbs up or smiles. And then there was the interpreter if things threatened to go wrong. 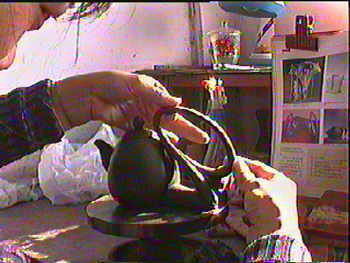 Cutting the leather hard pot was one task Guh Wei Fen didn't want to do. No way. 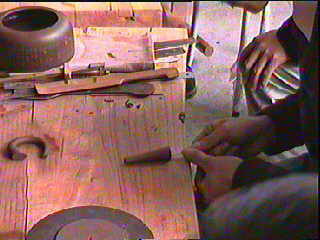 Cutting a good pot in two halves! She must have thought -I don't know what- about it. It was the only thing I had to do, the only time I actually held the pot in my hands and did something to it. But the result is incredible. A highly select group of Western Potters were invited by organiser Ah Leon who chose amongst his friends and colleagues. And what a fine selection it was.